The weather has remained warm here in Rome so Thursday we headed for the leafy Aventino district, home to the once-imperial palaces that became churches in the fourth and fifth centuries. Santa Sabina was quiet as we entered the vast space and considered the miracle of the life of Saint Dominic. For it was here he established his university for seminarians and it was here that he and Saint Francis met. The two orders of friars reformed the Church in the twelfth century, long before Ignatius of Loyola and Martin Luther. As always, I think of my characters here in the church they visited – Jack and Madeleine in Pilgrimage – and how the experience of these many churches in Rome healed Madeleine and changed her life. Each time I visit I find that I am changed, a new part of me is revealed. God writes straight with my crooked lines once again in this holy city, at least he keeps trying. We walked on to San Alessio, which always makes me smile. The young man of a wealthy family converts to Christianity and renounces his wealth. He travels as a beggar to the Holy Land and returns, unrecognizable to his family. He lives under an outdoor staircase of his former home. When he dies the family learns the truth of who he is from a note clasped in his hand. A remarkable story, mythic in the sense of family separation and attempted reunion, the transforming nature of becoming a Christian and then living in a pagan world or a pagan family. But the most remarkable part of the story is that the faithful have kept the staircase and you can see it – a kind of relic – in the north aisle off the entryway. It is surrounded by statuesque marble and a sculpture of Alessio sleeping, but there it is, ancient wooden – fragile – stairs. Only in Rome, I often think. But then my next thought is, only in Christianity do you find the humble made great, the earthy made sacred. We are a sacramental faith, allowing God to work through the matter of our world, to make matter matter by sanctifying it. the old Jewish quarter during the first century where trading ships docked at the wharves. The main Synagogue stands along the route to the right of the Tiber. St. Paul must have known this area, and St. Peter too, among many others mentioned in Holy Scripture. All these people peopled my thoughts as I walked toward the church of San Bartolomeo (thought to be Nathaniel in the Gospels) in the center of Isola Tiberina, Tiber Island. We entered the church and stepped into this warm, colorful, holy space. The tomb of Bartholomew is under the high altar. His relics lie in an ark-shaped sarcophagus that literally supports the altar. The side aisles have numerous chapels dedicated to modern martyrs – Nazism, Communism, Asia, Americas. It is an intimate church, unlike the great basilicas, and the small shop off the south aisle has lovely icons and posters for sale. This year they had a giant poster of the martyrs for ten Euro (about $15). It will be a challenge to pack it (ah, I’ll fold it I am sure, then try to iron it), but I couldn’t resist. 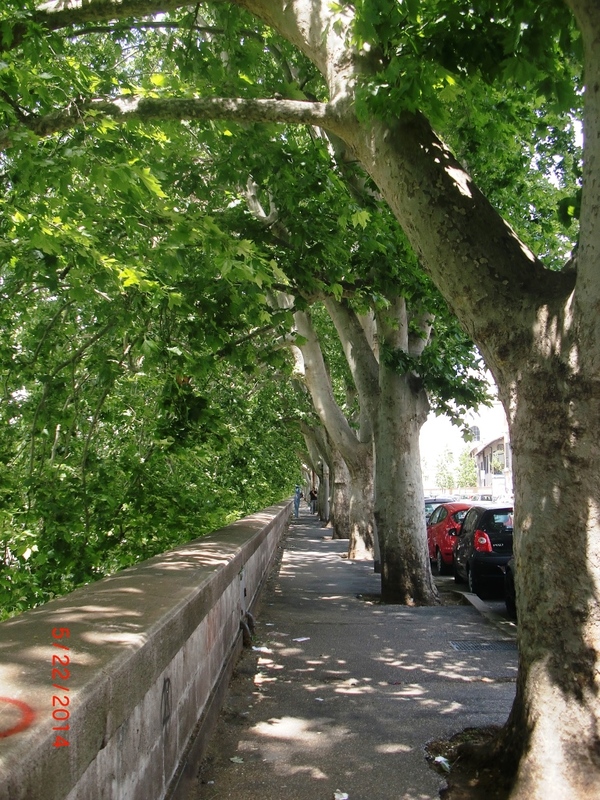 We headed up the river for more strolling under the giant shade trees, more photos of the Tiber, toward Piazza Navona for eggplant parmigiana and pizza and cokes. A colorful, charming, day full of the past enlightening our present, full of fresh air and old stone and river walks. Just about a perfect day.